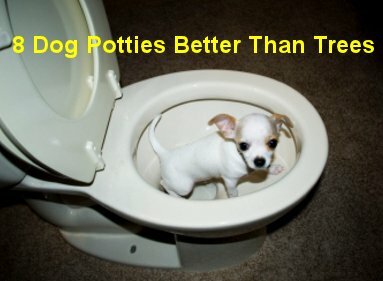 There are only two places where a dog can pee and poop: outside or inside. Now, we know some of you might say, "There's only one place my dog can poop!" Truthfully, I agree with you in theory, but even the totally housebroken dog may need to "go" inside at times. For example, there are dogs that won't go outside in the rain or snow. Heck, sometimes the owner doesn't want to go out there either! What happens to the inside dog, when his parents don't come home on time and a doggy-door is not available? Then there's the older dog or the sick pup, who may not be able to hold his urine or feces overnight. What if you are ill or injured and can't take your dog for a walk? Those who live in penthouses with love this solution. Here's a version of the Penthouse Potty that you can keep on your balcony. It's weather resistant, made of polyvinyl, but the insides are the same. The New Wave is 9" high and weighs only 23 pounds fully equipped. Both of the Penthouse Potties come complete; no doggy pads are required. Available from Cosmopolitan Canine. should be hosed off well. Available from Doggy Solutions. The reason I suggest you look into the dog potties at Metropolitan is that it has several different styles and sizes that look attractive and Metropolitan also offers custom-made options. 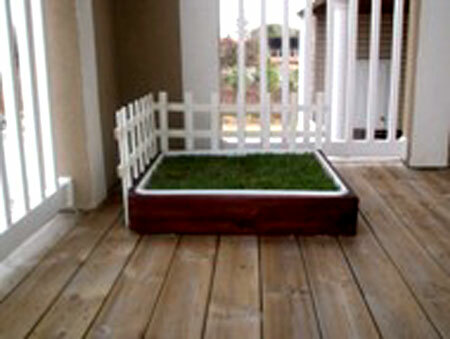 Models come complete with wood frames, foundation trays, tray liners, and faux grass. There is no grate; instead, the turf has 1/2" holes to drain urine. 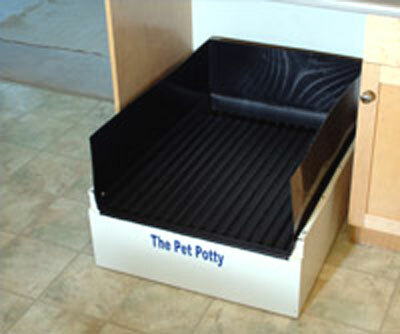 Check out what is offered at Metropolitan Dog Potty. 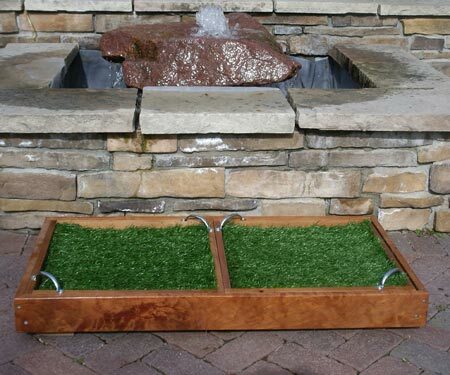 This is a much simpler version of the Penthouse Potties, employing just the innards of the same kind of system: a tray, a grate, and artificial turf that has the special smell that makes dogs pee there. This turf has an antimicrobial composition that keeps it from retaining the odors of urine and feces. 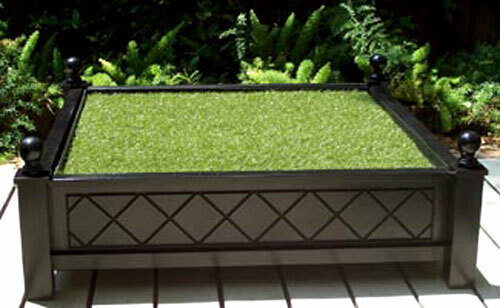 The Indoor Dog Restroom tray is a bit smaller than the Penthouses: 1" H x 30" W x 20"
L. (6 1/2 lbs.) Available at Hammacher Schlemmer. 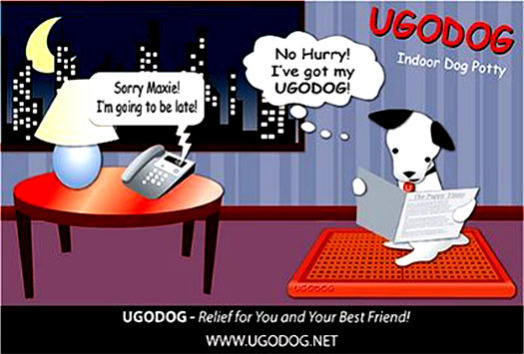 To UGODOG system uses just a grate and a shell -- no turf. There are actually two grates on the UGODOG that fit together, side by side, into the 28" x 19" pan; two grates are easier to lift and clean. 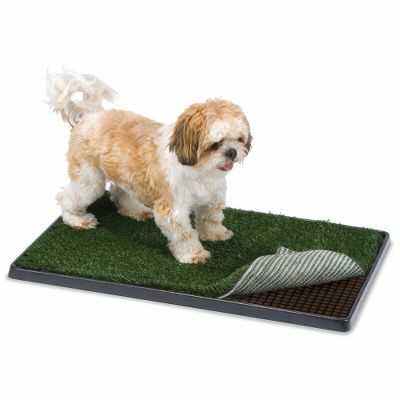 Also, the manufacturer suggests that grating is preferable to grass, because the dog doesn't step in his urine and track it all over the house. 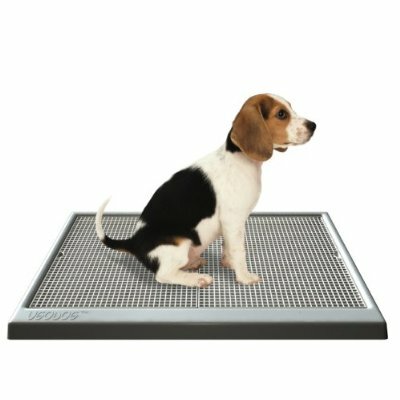 If you are concerned about the effect of the grating on your dog's paws, the UGODOG grating has apparently been designed to cushion the paws, through the use of convex beams. Supports small and large dogs. You can use newspaper between the grates and the pan, making cleanup a bit easier. Available at Amazon.com. This unit doesn't use litter, or turf, or gravel... nothing like that. Just an easily rinsable plastic tray titled atop a ceramic frame that attaches to your plumbing. When puppy pees or poops, you rinse it down with a hose and flush! There it goes! Sounds like a great solution, but it's pretty pricey for even a human toilet! At ThePetPotty.net. 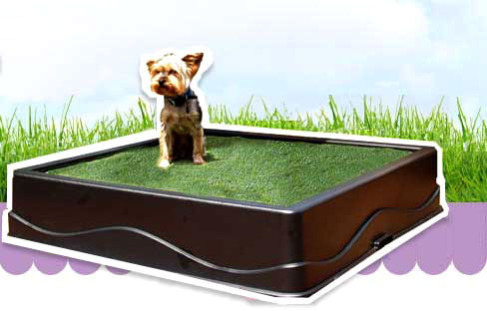 See the Pet Potty Dog Toilet in action on this YouTube video. I just had to include this, even if the Potty Rock is not, officially, a dog potty, but a housebreaking tool. 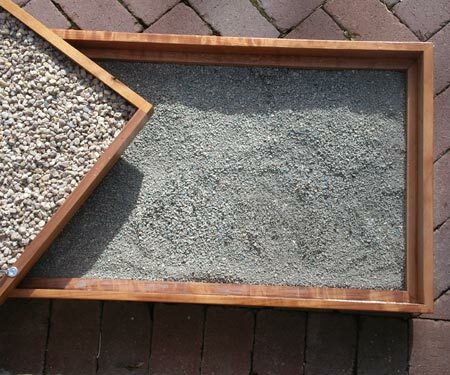 You can start using the Potty Rock inside the house, on top of some newspaper or other absorbant material around it. (The Potty Rock has the odor that's irresistable to a dog.) Once pup is housebroken, you can move the Rock outside to where you want her to "do her business," as seen below. Available at Amazon.com. 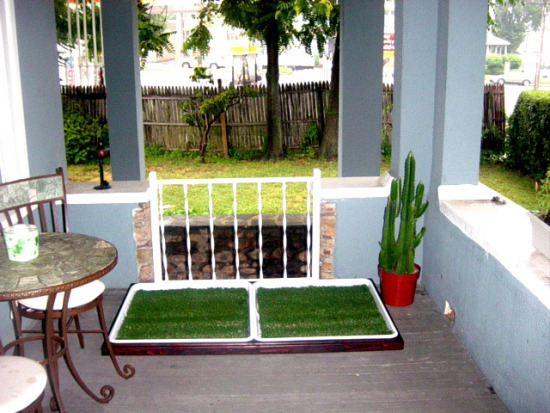 in this case is actually a 42" square grate covered by artificial turf. other mess from the turf yourself. Available from Cosmopolitan Canine. These dog potties are great for certain situations that physically prevent your dog from going outside for a walk or a run, but it's critical for Spot to get sun and exercise, just like you, so the dog potties should not be used in lieu of these activities. Additionally, if you can spare a few weeks at home to housebreak your new dog or puppy, I strongly suggest using a crate-training method instead of dog potty methods. Here's a spot where you can learn a bit about crate training. Pet Fur All Over Your House? Try "Shed Be Gone"